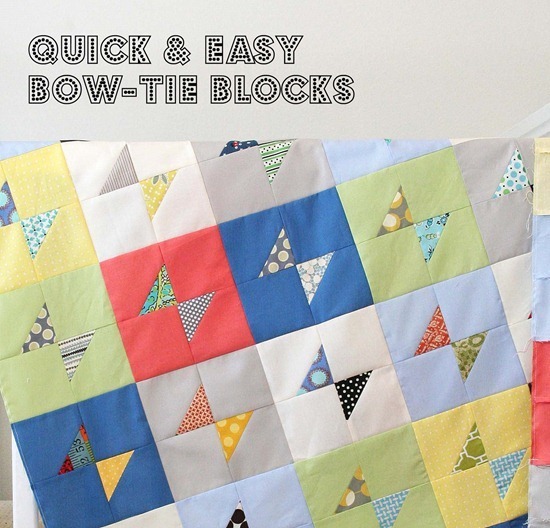 With the green light from Jolene (inspired from this quilt she made) I’m sharing a quickie tutorial for these fun little bow-tie blocks. 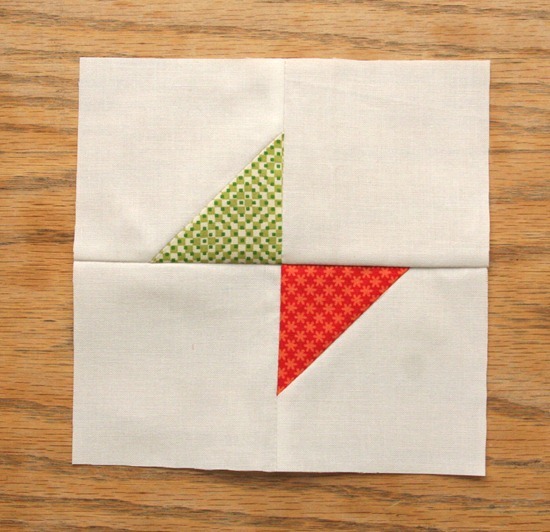 Sew the print squares diagonally from corner to corner on two of the background squares, right sides together. I eyeball mine using my machine guides…but I suggest drawing a pencil line from corner to corner on the back of the print squares or using the tape trick. Trim the corner leaving a 1/4″ seam allowance and press out. 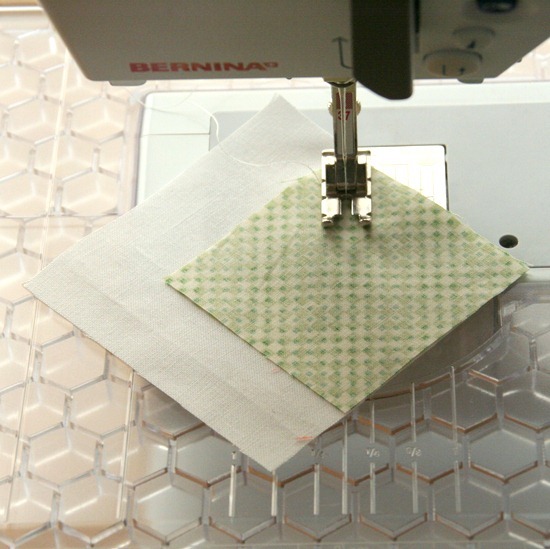 Lay them out, sew right and left sides together, press towards the print triangles…then sew the top and bottom together. The unfinished block should measure 6 1/2″ x 6 1/2″. For a baby size quilt like mine above…I made 42 blocks and laid them out in 7 rows of 6 blocks each. This is a fun way to use scraps and extra pieces of those solids you don’t know what to do with! This seems like a great pattern for a quick baby quilt. so simple. so sweet. love it. adore this simple block! Thanks for sharing! I can do that. The triangles may be wonky, but then I'll call it a wonky bow-tie block. It's so much fun being a noob quilter. I just love this quilt–and such a great way to use up extras from other quilts. i currently have a quilt like this about half way done. after seeing Jolene's i had to make one! Thank you soooo much! 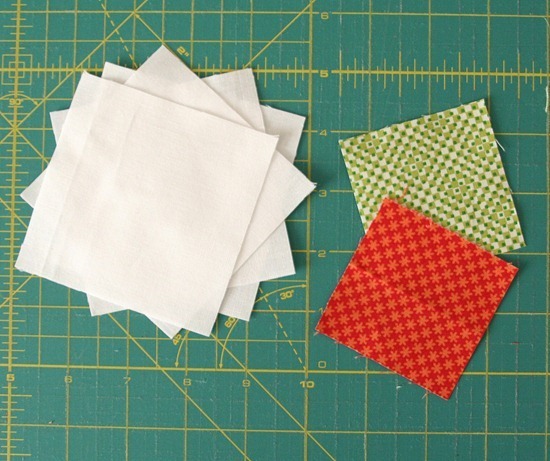 Your quilt really caught my eye the first time you posted it… thanks for sharing the how-to! HOLD IT: did you serge the edge of your quilt top? Clever. And, thank you for the tutorial, I love learning new things! I love this! Sewwww clever! Thanks for the tutorial! I will be making one of these for our church quilt ministry! Thanks for the measurements. I was wondering the size when you first posted this quilt. Great quilt for a donation. Thanks for sharing some great ideas with us, Nice Post! Thank you for sharing great information. Thank you for this tutorial. You make it look so easy! Thanks for the tutorial. An easy and quick way to take care of the scraps. And the result looks great. Allison I would so appreciate it if you let your readers know I am having a quilt fabric, pattern, Christmas giveaway on my blog at http://quiltingranny.blogspot.com and would love them to stop by. Also a book on grandparents raising grandchildren. Simply grand! Thank you Allison. But most of all it's something I can do with a little tape. I have quite a few Amy Butler scraps. Thank you for sharing with us. Thank you! I want to make it one day. awesome tute! thanks for showing us how its done. now i want one of these quilts! it's addicting! Send love and hugs and wish for your family on this special occasion. You should put this on your tutorial side bar. I originally found this quilt on your blog, then google-searched on how to make it…I just about danced a jig when I saw you had done a tutorial. Thank you!!! Great website! It looks very good! Keep up the great work!